Slice the apple into relatively thick rounds. Combine cheddar cheese and yogurt, in a bowl. Spread a layer of the yogurt mixture on each apple slice. For a variation of this snack, use pears instead of apples. They're similar in texture and flavor. 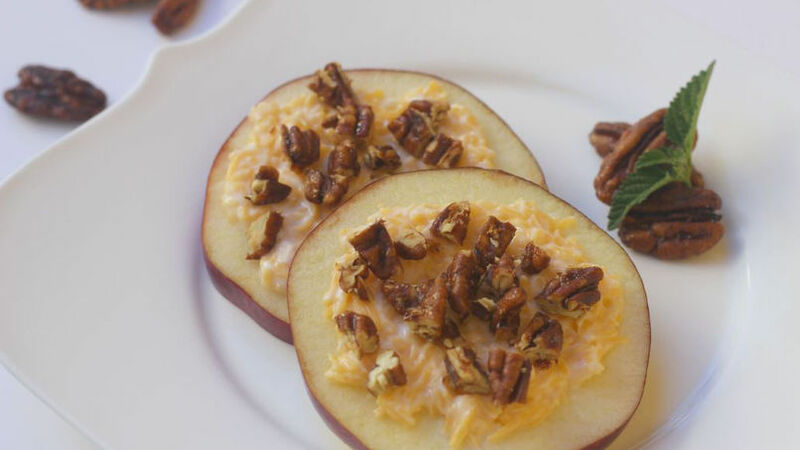 The combination of apples and cheese has always been a favorite of many people. It's common to serve them at parties, in kids' lunchboxes and as a healthy snack. I use this combination of flavors as a panini, but when we desire something that's a bit more refreshing, this recipe is perfect. They are ready in less than 5 minutes and both kids and adults enjoy the delicious flavor. Make the most of the apples that are in season. They are inexpensive and their flavor is the best.